Insurance companies play a vital role in enabling the smooth running of the franchising industry. They not only provide security for the franchisee, but also help to protect the reputation of the franchisor. However, it’s essential to choose an insurance provider that has extensive knowledge and experience of the franchising industry, to ensure they fully understand your business and can provide the most appropriate insurance cover for your needs. CBS is part of the Essential Risk Solutions (ERS) Ltd group of companies. Combined, CBS and ERS have over twenty-five years’ worth of insurance experience and have a reputation for providing excellent customer service and competitively priced (and, in some cases, exclusive) premiums. They have extremely strong relationships with some of the most renowned, ‘A-Rated’ insurance companies, underwriting agencies and Lloyds of London markets, meaning that their customers always receive high-quality insurance policies with secure markets. CBS works directly with the franchising industry to provide bespoke services to both franchisors and franchisees. As franchisors provide volume business, CBS is in an excellent position to negotiate bespoke insurance schemes for the industry. Franchisors receive a free consultation to assess their precise needs and can request bespoke wording and cover that is specific to their own businesses. This means that CBS can provide you with insurance cover that works for all of your franchisees across your network. They can also provide documentation that includes your own business branding, helping you to appear consistent and professional to your franchisees. And that’s regardless of industry; from restaurants and takeaways to health and beauty franchises. As a CBS customer, you have access to a dedicated account handler with a direct contact number, so you’ll never have to worry about wasting time on hold, trying to get through to a call centre! You will also receive claims guidance and assistance, risk management advice and support, as well as regular business reviews to ensure you always have the appropriate level of cover in place for your business. 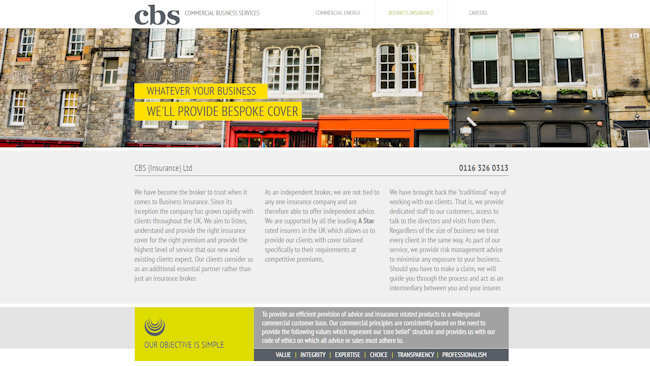 If you would like to find out more about how CBS (Insurance) Ltd can help you with your business insurance requirements, contact them today on 0116 326 0313 or visit their website at www.cbs-solutions.co.uk.